We are garden fairies and we are once again taking over this blog because we have something important and exciting to share with everyone. First, some small talk. Fall has truly arrived. You should have seen Carol hustling around the garden planting bulbs before it turned cold. On Sunday, she planted 1,100 crocuses in the Green Sea, which is what she calls the lawn. We are garden fairies, we are excited about this and can hardly wait until spring to see what this will look like. We plan to have a big party when these flowers all bloom and invite garden fairies, sprites, pillywiggins, wood nymphs, tree fairies, toaster fairies, and everyone else we can think of to come and see and help us with all the pollinating. It's going to be a big deal, so check back later in the spring for more details. We are garden fairies, we also noted that Carol planted another 430 bulbs around in the garden late Thursday, many in Bird's Blanket which is the planted area under the honey locust tree. She calls that border Bird's Blanket because there are a bunch of bird feeders nearby. Does she know that she'll get more birds visiting those feeders if she actually fills them with bird seed? Anyway, in Bird's Blanket she added more 'Lady Jane' tulips and some grape hyacinths. Then she planted yet more crocuses in groupings here and there in flower borders and some 'Easter Egg' tulips and oh, yes some species tulips. We are going to have a very busy, beautiful spring, we think. We also heard a rumor that Carol is going to try to buy exactly 70 bulbs today so that she will have planted an even 1,500 bulbs this fall. We are garden fairies, we like to call that a bit odd but we will welcome another 70 flowers come spring. The more bulbs, the better we say. But really, the bulb planting, exciting as it is, is not our Big News. Our Big News is that Thorn Goblinfly has changed her name. That's right. Thorn isn't to be called Thorn any longer. She said she never really liked her name which came from some fairy name generator on those Internets. She has pondered this for quite some time, probably more time than it should be pondered, but that's Thorn... oops, that's Violet. She can't really be stopped when she gets a notion. So anyway, Thorn...oops we mean Violet... has changed her name to Violet Greenpea Maydreams. She says it has great meaning. Violet was Carol's mom's favorite flower so that makes sense, even to us garden fairies. Greenpea is because Thorn... oops we mean Violet... says that Carol always thinks of her Dad when she plants peas in the spring. We are garden fairies, we can appreciate that. Maydreams is because Thorn... oops we mean Violet... says she wants to be forever associated with this garden where we live, May Dreams Gardens. We are garden fairies, that is fine with us. 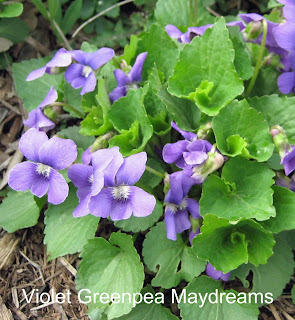 So Thorn... oops we mean Violet... should hence forth be known as Violet Greenpea Maydreams. Or for those who don't catch on so quickly Violet Greenpea Maydreams formerly known as Thorn Goblinfly. We are garden fairies, we don't know if it is a good idea to be changing names like this but we are going to go along with Thorn's... oops we mean Violet's... wishes. We are garden fairies. Violet is still the same to us and other than this post, we will still rely on her to post for us from time to time and tell the truth, as only she can, about what really goes on here in her home, May Dreams Gardens. Granny Gus McGarden, filling in for Violet GreenPea Maydreams formerly known as Thorn Goblinfly, chief scribe for the garden fairies at May Dreams Gardens. It may take me awhile to remember, but I do like Thorn's...er, I mean Violet's new name. She obviously cares a lot for Carol to have taken names that hold such special significance to Carol. Violet -- if plant people (taxonomists) can change the name of plants, then surely a garden fairy can change her name. I'm with you on the new name, too, because, well, I'm not crazy about thorns. A rose by any other name...er, I mean a Violet...well whatever. She is a fickle little fairy isn't she? Now she must change her driver's license and credit cards and everything. What a chore. What is a toaster fairy praytell? Oh, and I do love violets. Do you have any of the scented Parma violets in your green sea? Violet Dear. I think this name change is most appropriate. Thorn doesn't really fit you anyway. Thorn makes it sound like you are out slaying dragons in the garden while Violet makes it sound like you are busy beautifying the garden which of course you are doing. I think you should have a party to celebrate. I'm glad Thorn changed her name to Violet. Much more appropriate!